Dr. Google is so appealing. You type in your symptoms, hit enter and viola - millions of pages turn up. As anyone who has asked Dr. Google knows, it's very easy to find something scary...and to find many things not related to your child's illness at all. That's why Pampers wants to arm Canadian parents with resources to promote baby’s happy, healthy development. 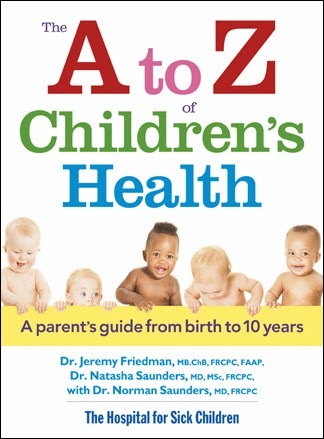 Sure to become your go-to health and wellness guide, The A to Z of Children’s Health is an indispensable reference that will solve every parent’s health query. Written by pediatric experts, Dr. Jeremy Friedman, Dr. Natasha Saunders and Dr. Norman Saunders, from the world-renowned Hospital for Sick Children, this comprehensive and contemporary guide covers over 235 childhood conditions and illnesses – from diaper rash to remedies for the common cold. The easy-to-read format will guide you through questions about your child’s health, providing practical tips and strategies that may help avoid countless hours of waiting in a doctor’s office or emergency room. The book is colourful and has lots of images and diagrams. The pages are laid out well (in alphabetical order! ), dealing with a variety of different conditions in the same fashion - What is the condition? What might happen as a result? How should the condition be treated? I know this is a book I will be using on a regular basis as long as I have a child. One lucky YYZ Bambina reader can say good-bye to Dr. Google forever when they win their own copy! I am part of a moms online forum. Most often I go there first because there will certainly be someone who has experienced it before. I will either run it by my mom or check online or in a parenting book. I go to my sister who has had 4 kids. I hate to say it but the internet !! First I check in with common sense, if common sense is on strike I confer with Google, then Nurses Helpline if I'm really stumped. First step is friends and family. If that doesn't work then the professionals.